The EGG-cellent Do-It-Yourself jt.com Easter Greeting! The EGG-cellent jeffthomas.com Easter Mad Lib! The apostles Mark, Luke, Matthew and John ... Beatrix Potter ... and you! 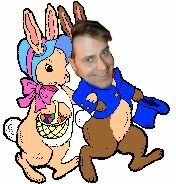 This holiday season, jeffthomas.com harnesses the power of the "Mad Lib" to give you the opportunity to join the elite among Easter authors! Simply fill in the blanks to create your classic holiday tome!